The CareGiver Partnership: My Mom Lives Alone, How Can I Make Sure She Is Eating? Many children of seniors worry that their aging parents who live alone are not getting the proper care and nutrition they need. This is a very legitimate concern, as over six million US seniors are at risk for malnourishment. Concerned about parents eating properly? Malnourishment in seniors is a very serious problem, as it can lead to increased risk of infection, long hospital stays, delayed wound healing, depression, muscle weakness, impaired respiratory function, and many other problems. Malnourishment can be caused by a variety of factors, from reduced intake to difficulty with eating and swallowing, to simply a lack of availability of healthy fresh foods. When you add that to common problems in seniors such as impaired absorption, altered metabolism, and losses from things like stomas, vomiting, diarrhea, etc. it can be a real challenge to make sure your senior loved ones are eating, and getting the right foods, and proper nutrition. Malnutrition in seniors often goes undetected and untreated until the senior is saddled with serious health consequences, costly medical treatments, and compromised health. As a caregiver, there are many ways you can make sure your parent is eating. You can put them in a care facility, you can take over meals for them, etc. But often these options are expensive and very inconvenient. And they are not always effective. “Malnutrition, dehydration, and weight loss in nursing homes constitute one of the largest silent epidemics in this country,” said Karen Davis, president of The Commonwealth Fund. Affordable- Mom’s Meals offers a low cost option for providing convenient, healthy, nutritious meals for seniors. The cost is $5.99 per meal, plus shipping, which is $14.95 for ten, fourteen, or twenty-one meals. This is a lower cost than pizza delivery, and you get far better nutrition. Tasty- Mom’s Meals makes a commitment to providing meals that actually taste good, and are not just healthy. In fact, they state that their meals “need to be tasty enough to serve to our own family because to this day, our own moms still get our meals”. They use professional chefs to create their menus and provide options that seniors will enjoy eating. Mention "caregiver" and receive your first meal free. Variety- There are 6 different menu types - Mom's full menu, heart healthy, diabetic friendly, Renal, Gluten free, vegetarian. They offer over 70 meal choices, and because the menu is not prescribed, the senior can choose the meals that sound best to them, insuring they do not get sick of the food, or have to eat something they do not like. 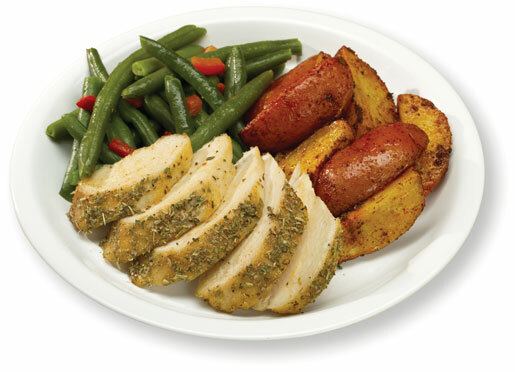 Healthy- Mom’s Meals only uses fresh ingredients. They do not use anything that is frozen or freeze dried, etc. These meals are like eating a meal your mom prepared for you. And, they stay fresh for 18 days in the refrigerator (40°F), due to break-through Fresh-Lock packaging, which allows seniors to eat any meal anytime they want. Convenient- The meals come prepared, and take only 3 minutes to heat in the microwave. They are delivered to the door of the senior’s home, and the driver can even bring them into the kitchen if you wish. They can help seniors meet special diet restrictions and considerations like heart-healthy, diabetic-friendly, or gluten free. They eliminate the need for seniors to get out of the house, shop, or get around the kitchen to prepare foods. All the work is done, and they even provide some suggestions and tips for customizing the flavors at home to make them more appetizing to the senior. Now that's convenient - I can imagine a lot of people needing a service picking and packing food for their elderly. The best part is that the menu is diverse enough that even younger generations will love the food.